This eBike tour takes you to the Spa for the day. 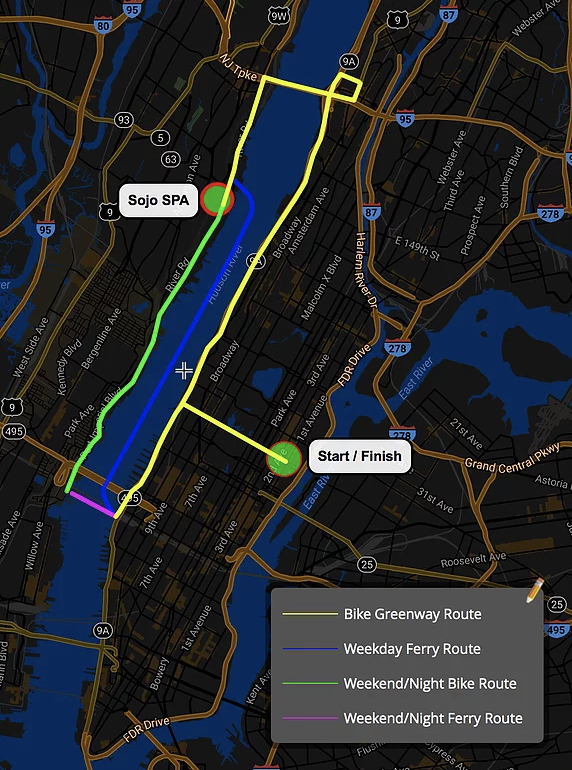 We ride our bikes on the Westside Highway Greenway to the George Washington Bridge Bikeway, cross the bridge into New Jersey, and take the bike path (parallel to the river) to SoJo Spa Club. You get to see spectacular views of Manhattan on this route. Once we get to our destination, we lock up the bikes and enter this magnificent six-floor spa filled with so many amenities. Maybe you want to lay out in the sun at the infinity pool on the roof overlooking the Manhattan skyline. Or you can choose from seven different kinds of hot tubs, five saunas, a steam room, full spa services, a gym, heated stone tables, and so much more. You have three hours to enjoy yourself at the spa before we head back to Manhattan via ferry across the Hudson River. Once we get back into Manhattan, we take the Westside Highway Greenway back uptown and cross through Central Park back to East 75th Street. This is truly an experience of a lifetime. Keep in mind, weekends in the summer are very crowded compared to weekdays. SoJo Spa Club is not affiliated with NYC Adventure eBike Tours.